Commandant Gen. Jim Amos met with reporters today at the Pentagon, leading me to ask him about the reports this week that his assistant commandant, Gen. Joseph Dunford, is the frontrunner to become the next commander of the war in Afghanistan. It’s one of those classically awkward situations where journalists feel required to ask a question, knowing it’s unlikely a full answer can be provided. 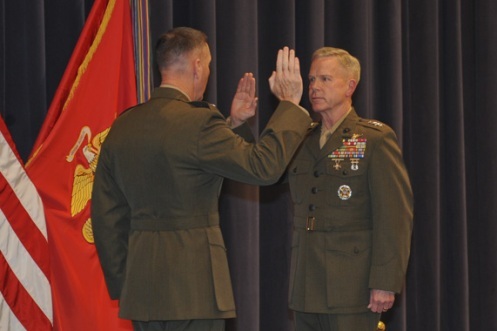 Asked what he would do to replace Dunford, Amos called him “one of the finest officers who have ever worn this cloth,” but declined to go much farther.